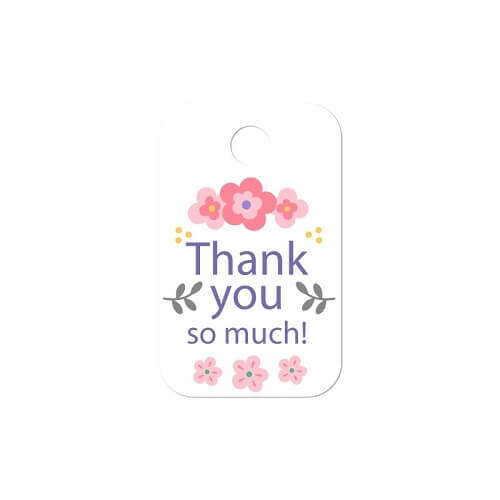 Favor Tags are some of the most used decorative items utilized on party favors like wedding, birthday, anniversary or any yearly party favors passed along to the loved ones to make the gifts look and feel much better. Wedding Favor Tags are provided color, design and embellishment themes exactly in wedding design themes and similarly birthday favor tags or other event’s Custom Favor Tags are treated the same. Go Stickers offers them in high quality durable and non-bendable or flexible materials depending on your requirements and can provide just the enough space on their surfaces for all the fancy designs and personalized messages to be printed or hand-written. Avail our free shipping, free printing and free cutting die equipment on large wholesale orders along with cheapest bulk prices. Go Stickers have some of the most advanced processing, designing and finishing equipment available that we use to deliver attractive designs with unique customizations. Our finest Offset printing technique delivers customizations including gold/silver foil stamping, raised ink printing, embossing or debossing designs and texts and high-quality color and design treatments for your Personalized Favor Tags. The Wedding Favor Labels we offer can be customized in terms of their printing or surface textures according to the need as well. Choose from our extensive variety of designs or let us know exactly what you need, we will satisfy all requests efficiently. Custom Gift Tags are used to beautify your adorable gifts, and we use high-quality surface finish options to provide them with just that. Our Party Favor Labels or Tags can be finished in elegant matte, posh gloss or spot UV options and can complement your gift packaging beautifully and suitably. 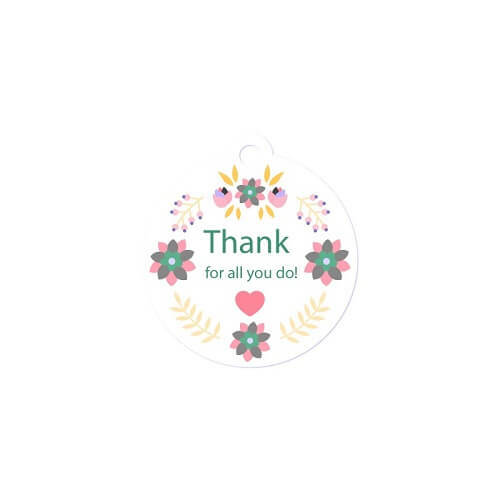 Custom Wedding Favors can use our tags in Thank You Tags for Wedding Favors finish with surface embossed messages, adding charm to your gift packaging as well. Additionally, we make sure to use high quality, well-processed materials that are available in rigid, non-bendable finish or the soft, flexible finish depending on your preferences and the way you need to use these Wedding Gift Tags. At Go Stickers, we are industry leaders in designing and printing, and we have skilled, experienced Personalized Wedding Favor Label designers who are always willing to help you get some of the most attractive and beautiful designs for your Wedding Gift Labels or Tags. We offer free design help with free templates provided showing you just how your designs will look when finished. We are proud of our skilled team of tag designers and friendly and helpful customer care agents are always waiting for your call and will offer free help on large wholesale orders. Different people prefer Custom Wedding Favors labels in different material designs, sizes or dimensions, we provide these beautiful tags and labels in any required sizes or designs. Our state of the art cutting dies equipment processes high-quality materials inaccurate and precise ways of cutting them in all the required sizes and designs. Whether you want round favor labels, square ones, rectangular designs or any fancy futuristic designs and unique sizes, we will deliver them in satisfactory finishing with all edges and sides made smooth and well-taken care off. There is no limitation in sizes and designs, you biggest and smallest party favors can now get any required size labels and tags at attractive wholesale prices. If you are a Custom Favor Labels or Tags wholesaler and are looking for lowest bulk prices and yet no compromises in any of the quality features including printing, material quality, die cut sizes or surface finishes, Go Stickers is your top choice. We keep our profit margins lowest and prioritize in achieving customer satisfaction and long-term business relations. Our high-quality party tags are available at lowest wholesale prices with free cutting and printing equipment on bulk orders as well providing the highest value for money in the industry.